This pasta salad is not like your normal picnic pasta salad. When I think of pasta salad I often think of macaroni salad. You know, your typical mayo based pasta salad with pickles. Lots of pickles! I am not sure why I always go to macaroni salad, but I just do. It's a great accompaniment to a BBQ (mmm burgers! ), but I don't always want a pasta salad covered in mayo and one that leaves me full and feeling heavy. That's just me though. If you like mayo only pasta salad, run away from what I am about to tell you. I wish you don't run though - this pasta will knock your socks off. I promise you that. It's so delicious. This pasta salad is loaded, LOADED with flavor. The best part is that it is super easy to make and throw together - less than 20 minutes! The dressing can be made a day ahead of time and you can chop the olives and halve the grape tomatoes early too! Don't you just love do ahead recipes? I know I do. It makes me less stressed in the kitchen. I will be the first to admit that not only am I bossy in the kitchen, I can get pretty cranky too. Just ask the captain. Poor guy has to put up with me. Guess he must still like me if he's been around this many years, right? Right! Okay, back to noodles. I had my eye on this Pioneer Woman recipe for awhile (when do I not have my eye on one of her recipes - she is awesome!) and then the perfect time came to make this (and boy does it make enough to feed a crowd!). I made this last month for our Mother's Day BBQ and it was the perfect side dish to go with the burgers and grilled veggies. The sauce is super easy to throw together. 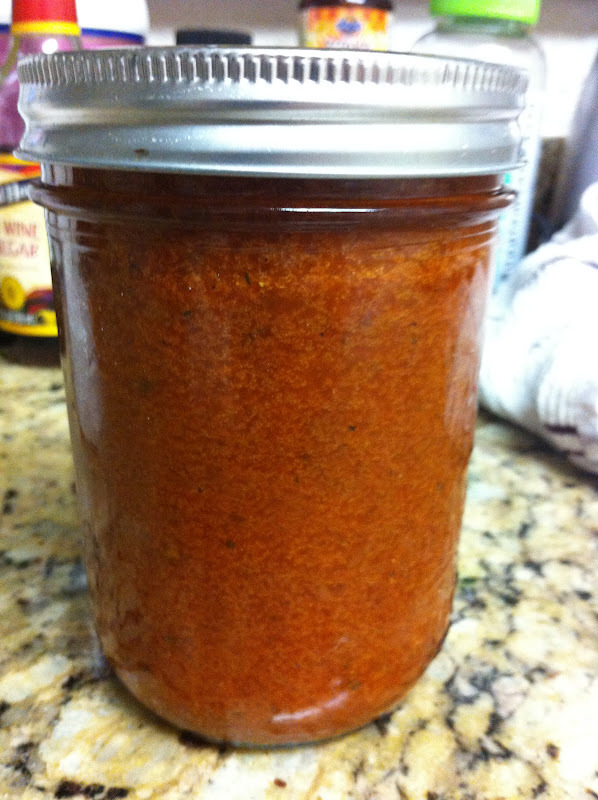 Just blend (or using a food processor) sun dried tomatoes, olive oil, garlic, red wine vinegar and salt and pepper. Five ingredients or less? Yes, yes! Pioneer Woman's recipe called for a whole cup of olive oil, but I cut it down to 3/4 cup. Don't ask me why, I just did. If you are feeling sinful, go ahead and use a whole cup. I won't tell anyone. Once everything is blended, boil the noodles (I used whole wheat for added fiber and vitamins, but you can use regular pasta if you'd like), drain and then toss half of the dressing on the noodles. You can always add more, but start with half and then add more to coat to your liking. Then toss in the grape tomatoes, olives, parm cheese and basil. Toss everything and you are ready to enjoy. The flavor this salad gives you is a blend of pasta puttanesca and caprese salad. Don't know what either of those are, don't worry. It's just delicious. Best of all, since there is no mayo in this salad, you don't have to worry about it sitting out for hours on end if you make it for a BBQ or party. That is if it lasts that long. Trust me, it won't. blending - this garlic from trader joes is the best! blended and ready to use when I make the salad. grape tomatoes, olives and cheese! ready to eat. how good does that look!?! 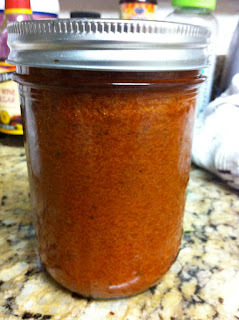 For the dressing, in a blender combine sundried tomatoes (drain the oil they are in), garlic, salt, pepper, and vinegar until tomatoes are chopped. Continue blending while drizzling in olive oil until mixed together. Can be made the day ahead or the day of. Cook pasta according to package directions. Drain and rinse with cold water until no longer hot. Pour 2/3 of the dressing over the pasta. Add olives and toss together. Add remaining ingredients, tossing together and adding more dressing until the salad is coated to your liking. Serve on in a big bowl with an extra sprinkling of Parmesan cheese. This pasta is great the day it's made, but it's even better the next day!